Roeder House, Fire Island Pines, NY, 1969. Architect Horace Gifford. Between 1962, just a few years after he left school, and 1992, when he died, architect Horace Gifford built forty modern houses on Fire Island, the sandy sliver of land that buffers Long Island from the Atlantic Ocean. A new book by Christopher Bascom Rawlins, Fire Island Modernist: Horace Gifford and the Architecture of Seduction, recognizes his legacy. Fire Island, a 31-mile long stretch of ungroomed white beaches and wild grasses that, at its widest points, is not even three miles wide, is a fragile landscape, vulnerable to storms and erosion, with minimal infrastructure. Most areas are connected with boardwalks and have no roads, and are reached from the mainland most easily by ferry. This unique geography fosters tight, intimate communities, and over the decades the island has been a vibrant haven for artists and for gay men and women. In the summer its population swells with day-trippers and revelers. Gifford’s houses, modestly scaled and terrifically stylish, suit both the place and the people. They’re constructed from the same mundane materials that suburban wood frame houses are, but rendered in sophisticated modern forms. Paulo Niemeyer Apartments, Belo Horizonte, Brasil, 1954-60. If we stop to remember Oscar Niemeyer, the great Brazilian architect who died this week at the age of 104, it should be less to mourn his passing than to admire a life richly lived. Niemeyer accomplished what few architects can. Over a career that spanned eighty years he designed hundreds of buildings whose forms helped forge his country’s contemporary identity. He built Brazilian style. Niemeyer was in the right place at the right time and possessed just the right attitude. His country’s immense, rolling landscape and tropical climate offered the perfect setting for an abstract, sculptural architecture. 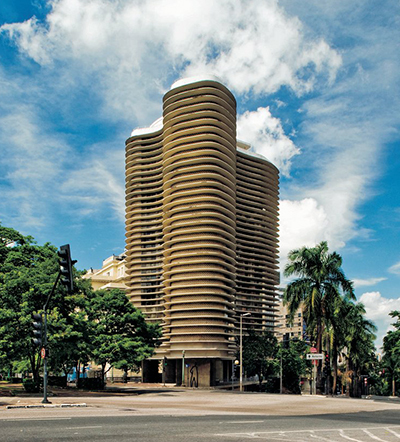 He came of age as an architect in the 1950’s, at a time when Brazil was becoming more unified politically and undertaking enormous building and infrastructure projects. And he was a unrepentant sensualist, an aesthete and ladies man whose passions drove him to pursue enormous commissions like the capitol buildings in Brasilia, and to celebrate beauty above all else. All of these identities were merged in his work, an architecture of immense reinforced concrete shells and planes, at once archly elegant and dazzlingly sensual. His style has been called “tropical modernism” to distinguish it from the works of European contemporaries, who used a similar vocabulary of slender columns, open plans, and ribbon windows, but who fixed its rules and meanings philosophically. Garden and house, Tokyo, Japan, 2011. Office of Ryue Nishizawa. If there’s any rule at all governing architecture today, it’s that anything goes. Advanced computer-assisted modeling and fabrication techniques make it possible to build highly complex shapes. Emerging economies and burgeoning cities demand super-sized structures. And there’s no lingua franca for architects working around the world: just about anything each one of them draws can be built. A new book, The Sky’s the Limit: Applying Radical Architecture, takes a closer look at some prominent avant-garde buildings from around the world and tries to puts a finger on what’s really going on. It’s no easy task. This book classifies buildings according to their physical character: organic, sharp-edged, pixellated, interior, and outward-looking. 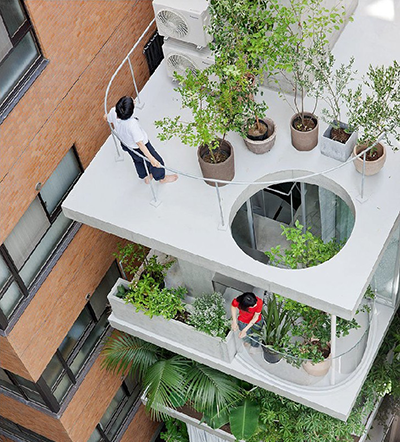 While radially different from one another, each of these approaches can be understood as a form of resistance to the generic, commercial glass-box buildings that have come to populate our cities. There’s a movement towards gently swollen and rounded forms, expressed in a language similar to Zaha Hadid’s Acquatics Center for the 2012 London Olympics. There’s also a movement for modulated structures that have been broken into an array of smaller parts, like Frank Gehry’s Guggenheim Museum in Bilbao. 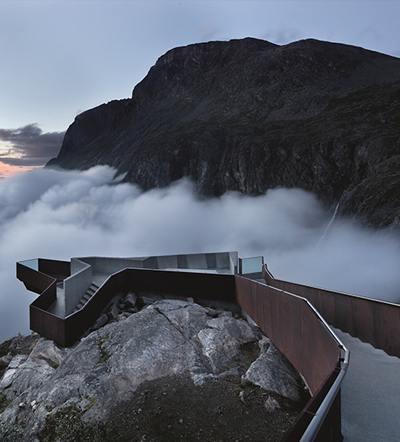 Both these types of buildings reflect a yearning for more varied, surprising and sensual forms. In that sense they’re opposed to orthodox twentieth-century modernism. Alpine Hut, Stara Fuzina, Slovenia. OFIS Arhitekti. Photo © Tomaz Gregoric. We already know that green living means making houses that are smaller and more energy-efficient, reusing existing structures, and incorporating repurposed materials. 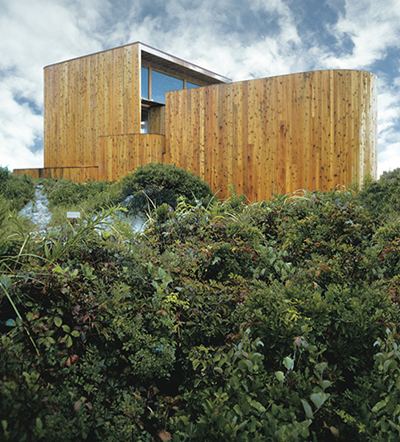 The new book Small ECO Houses accepts these assumptions and adds a provocative new one to the mix: prefabrication. Most of the houses in this portfolio of outstanding new designs from around the world are mobile homes, or have been assembled from standard modules that were fabricated in a workshop and then delivered to the site. Yet they’ve been conceived with such refinement that it’s difficult to believe they weren’t custom-made. 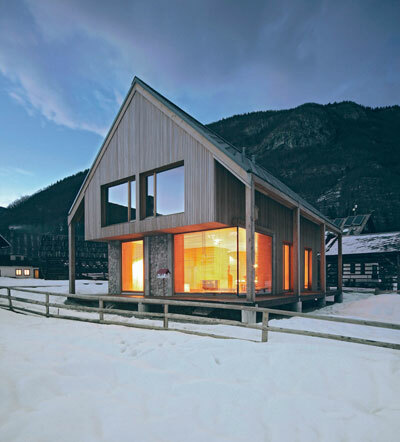 In the United States, certainly, prefabricated houses carry a strong stigma. They’re considered shoddy and impermanent, a kind of shelter that’s more appropriate for emergency relief than real living. Now designers are looking more closely at prefabrication as a way to control costs and quality by employing highly skilled craftspeople to build on a larger scale in a controlled, studio environment. And designers are bringing a broader, more sensuous palette of materials to the task. There are no white corrugated aluminum panels or flapping screen doors here. Instead, the modestly-sized structures pictured in the book are clad with wood boards, steel panels and rough brick that will weather naturally over years. And the structures are finished with a layer of details — awnings, railings copings — that add sophistication. 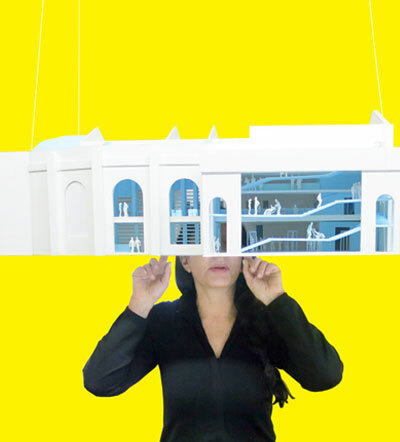 Rem Koolhaas and Shohei Shigematsu of the Dutch architecture firm OMA will lead the design and construction of Marina Abramović’s performance center, the Marina Abramović Institute for the Preservation of Performance Art (MAI). The Institute, for which funding is currently being procured, will be located in a former theater in Hudson, New York. The large space is designed to host long-duration performances as well as workshops, lectures and festivals, all centered on time-based, performance, or otherwise fleeting art—the work that can’t be stored in a museum. The purpose of MAI is to preserve the history of immaterial art while also creating a laboratory to explore new collaborations and cross-genre practices. OMA seems a proper fit for Abramović’s institute. 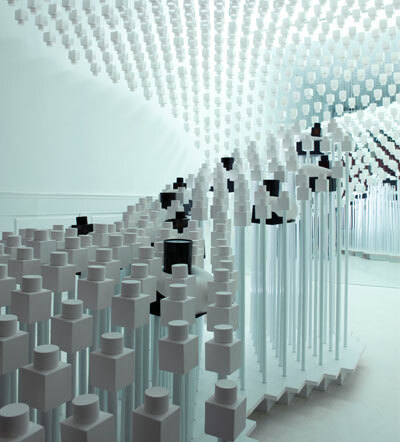 Founded in 1975 by Koolhaus and others, the firm has designed many innovative art spaces around the world, including the irregular, inverted Casa da Música in Porto (2005), and the vertically “stacked” Wyly Theater in Dallas (with REX, 2009). Besides the stadium-like main performance space, which will seat an astonishing 650 people, MIA will have rooms specifically designed for study, meditation, exercise, and crystals. 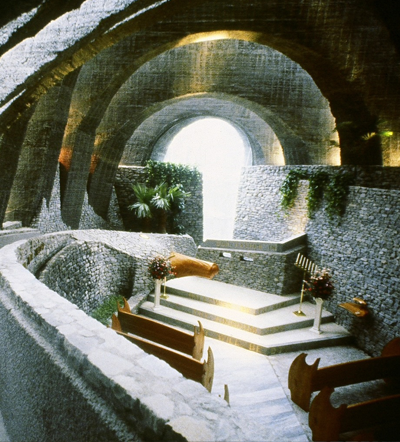 Hoshino Chapel, Karuizawa, Japan, 1987. On his website home page, San Diego architect Kendrick Bangs Kellogg says this about his work: “Large or small, Since 1957, Anywhere on earth or moon.” For those familiar with his buildings, dense structures forged from expressive, otherworldly forms, these assertions seem right on. They’re a succinct expression of Kellogg’s sweeping, elemental architecture. When the back-to-the-earth movement first took hold in the 1960’s and 70’s, a great number of people abandoned their subdivisions and cities and set out to build their own homes. Today, as Americans grow more passionate about sustainability, home remodeling, and artisinal craft, it seems like the perfect moment to look back at the handmade house movement and also at the houses themselves. A new book, Handmade Houses, by Richard Olsen, does exactly that. Olsen revisited first-wave handmade houses around the world, many of which are now thirty and forty years old. Built lovingly and exuberantly from timber, fieldstone, plaster, and sod, these aren’t the kinds of houses that adorn typical coffee table books. The book’s warm, personal narratives and sumptuous photographs are pleasing, and at the same time offer some powerful, countercultural propositions about lifestyle, aesthetics and design. These are houses that were built one-at-a-time without regard for conventional styles, with an eye to the character of the owner rather than the demands of the market. 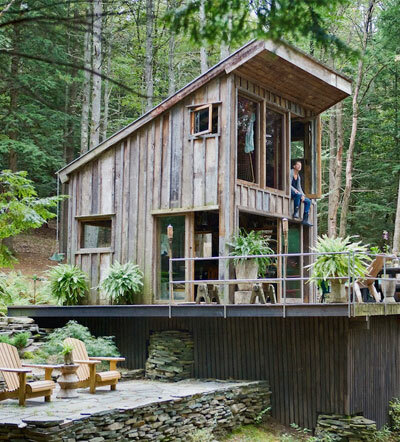 Olsen recently shared his ideas with Planet about the origins of the handmade houses movement, its relevance today, and his own quest to build a handmade house. Party Foundation Monument, Pyongyang. Images courtesy of DOM Publishers and Philipp Meuser. 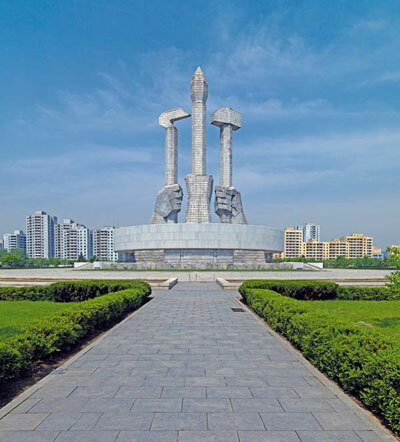 The Architectural and Cultural Guide: Pyongyang looks like any other city book for savvy travelers. It’s crammed with luscious maps and photographs and formatted in two slender, easy-to-carry volumes. But the guide is really a kind of provocation, since it’s virtually impossible for citizens of democratic countries to visit the North Korean capital city, home to three million people, unless they enter through China and travel with a government-led tour group. And the city’s only sanctioned tourist destinations seem to be its bombastically over-scaled memorials, museums, and sports arenas. The book doesn’t offer up any obvious tourist attractions like shopping streets, historical districts, or grassy parks, but instead formidable concrete government buildings and apartment towers. Not surprisingly, estimates are that the city welcomed only a few hundred tourists last year. This is not Paris.